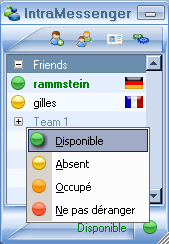 IntraMessengeris a free instant messaging client which also has fully-fledged file sharing and exchange capabilities. This makes it an ideal way to share, publish or exchange files on an intranet or the internet. ("public files", accessible to all, or to groups). Option _SHARE_FILES_PROTECT allow if needed to uncrypt files (and compress) before send. (or by any other person accessing the FTP server) but only from the clients. System requirements: a web serveur web (Apache + PHP + MySQL) and FTP access. Only a windows client is available (currently). It's look like a Seedbox.